Petition idea: Debate the merits of a wider carbon tax (or equivalent) with revenue raised being directed back to the people or to long-term innovation investment. Taxing carbon is one of the best ways to incentivize the reduction of greenhouse gas emissions. By putting a price on carbon, emitters are confronted with the environmental cost of their actions and forced to manage their carbon output. While other policy interventions are also required, putting a price on carbon is central to reducing emissions cost-effectively. As part of the EU, the UK is involved in a form of pricing carbon via the EU emissions trading system (EU ETS). However 58% of emissions are out of scope of the EU ETS as they originate in transport, buildings, waste management and agriculture. If the UK leaves the EU there are scenarios where a Carbon Emissions Tax will be collected but only by UK stationary installations currently in the EU ETS. Parliament needs to debate the introduction of a wider carbon emissions tax for all industries and sectors and in a way that is just for society. A carbon tax or similar is widely supported by economists (both those associated with right wing ideas as well as those associated with left wing ideas). It goes across political lines. There is support from business and industry. Most notably many fossil fuel companies are supportive, but the support cross all business industries (for instance, Microsoft). Much of the infrastructure is already in place to be able to collect such taxes. A carbon tax is considered “regressive” as it impacts those on low-income more than higher income. A “Carbon Dividend” could be committed to be given directly back to the UK people. This would mitigate the regressive impact. This could be means-tested to further help those on lower income. Adjustments to VAT could also be made. A graduated ramp up can also mitigate impacts. Or, when, for instance, electricity prices go up by £100, the government could give a £100 dividend that lowers internet costs of a similar non-carbon intensive good/service. The tax revenue could also be ear marked for innovation. As energy innovation is likely to be a vital part of transitioning to a lower carbon economy. The tax revenue could also be ear marked for other positive long term investments such as healthcare or education or other investment which have broad support. A border adjustment for carbon content of imports and exports may be needed to discourage free-riding by other nations. Formation of a “climate club” as suggested by economist William Nordhaus should be explored. A mix of all the above ideas is possible and deserves debate. A comprehensive carbon tax plan should enable reduced emissions, predictability for business, and stimulate long-term investments. There is strong support from multiple stakeholders across the socio-political divides for a more comprehensive carbon tax. This support is further strengthened by economic and academic work and popular opinion. Negative economics can be mitigated leading to an overall positive for society. This needs proper parliamentary debate. A near universal benefit/dividend softens the tax impact. Means-testing in general is expensive and prone to errors, it may be better to simply give benefits widely or at least to 80 percent of people, almost universal. Carbon price escalators have been deemed a success because it provides visibility and graduation; allowing businesses to plan. The proceeds must be ring-fenced by law so the Treasury doesn't raid it and then split into three elements: one, which goes to everyone except the richest, another to innovation and the remainder specifically to industries that are stranded or most severely affected by anti-competitiveness from carbon tax. Making sure the impact does not fall on the low income is important, which is why the re-distribution element is crucial. I have friends and friends of friends, loosely involved with Extinction Rebellion - it is a form of holocracy (self-organising). I think a middle of the road type of person’s first instinct might dismiss this as somewhat crazy. Borrowing from NIke’s successful ad campaign (and Cf. Thinking Bigly) it’s only crazy until you do it. While I’m fairly uncommitted ideologically, I think supporting others in their strong views is valid. This FT article looks at some of the prominent members of the Extinction Rebellion movement, and gives you an insight into their thinking. It’s pretty coherent, even if you disagree. They Grew Up Around Fossil Fuels. “Chris Riley comes from a coal town and a coal family, but he founded a company that could hasten coal’s decline. Lee Van Horn, whose father worked underground in the mines, spends some days more than 300 feet in the air atop a wind turbine. They, and the other people in this story, represent a shift, not just in power generation but in generations of workers as well. 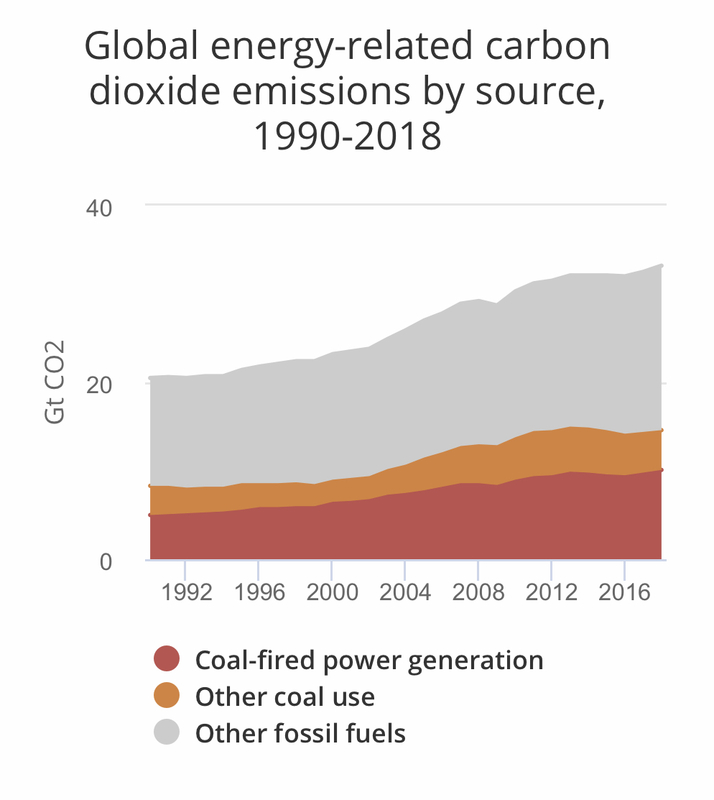 Global energy-related CO2 emissions grew 1.7% in 2018 to reach a historic high of 33.1 Gt CO2. It was the highest rate of growth since 2013, and 70% higher than the average increase since 2010. Last year's growth of 560 Mt was equivalent to the total emissions from international aviation. The increase in emissions was driven by higher energy consumption resulting from a robust global economy, as well as from weather conditions in some parts of the world that led to increased energy demand for heating and cooling. CO2 emissions stagnated between 2014 and 2016, even as the global economy continued to expand. This decoupling was primarily the result of strong energy efficiency improvements and low-carbon technology deployment, leading to a decline in coal demand. But the dynamics changed in 2017 and 2018. Higher economic growth was not met by higher energy productivity, lower-carbon options did not scale fast enough to meet the rise in demand. The result was that CO2 emissions increased by nearly 0.5% for every 1% gain in global economic output compared with an increase of 0.3% on average since 2010. 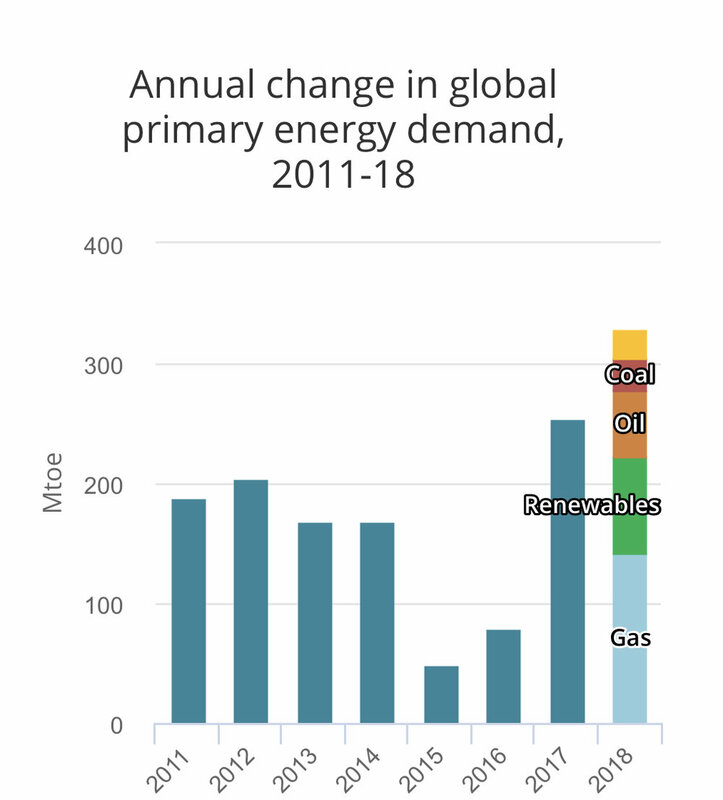 Renewables and nuclear energy have nonetheless made an impact, with emissions growing 25% slower than energy demand in 2018. For the first time, the IEA assessed the impact of fossil fuel use on global temperature increases. It found that CO2 emitted from coal combustion was responsible for over 0.3°C of the 1°C increase in global average annual surface temperatures above pre-industrial levels. This makes coal the single largest source of global temperature increase. The global average annual concentration of CO2 in the atmosphere averaged 407.4 ppm in 2018, up 2.4 ppm since 2017. This is a major increase from pre-industrial levels, which ranged between 180 and 280 ppm. Germs from Europeans arriving in the Americas from 1492, caused the native American population to die in large epidemics. With the loss of 90% of the human population, much of the agriculture land turned back into forests. These forests acted as a large carbon capture sink reduced the Earth’s temperature significantly causing a mini ice age / cold spell. The arrival of Europeans in the Americas in 1492 CE marks the onset of disease epidemics resulting in the loss of the majority of indigenous people living in the Americas over the subsequent century (Berlinguer, 1993; Cook, 1998; Crosby, 1972, 1976; Nunn and Qian, 2010). Indigenous land use was widespread before European arrival, particularly in Mexico, Central America, Bolivia and the Andes where terraced fields and irrigated agriculture was practised (e.g. Abrams and Nowacki, 2008; Chepstow-Lusty and Jonsson, 2000; Heckenberger et al., 2003; Hunter and Sluyter, 2015; Whitmore and Turner, 1992), and across Amazonia where diverse pre-Columbian land uses left its traces in the composition of contemporary Amazon forests (Clement et al., 2015; Levis et al., 2017; Maezumi et al., 2018a; Watling et al., 2018). Thus the Great Dying of the Indigenous Peoples of the Americas (Wolf, 1982) after 1492 CE likely led to a reduction in land use. Fields and fallow areas then underwent secondary succession and in many cases increased carbon stocks as they reverted towards similar prior states – with local, regional and potentially global consequences for the Earth System. Lord Nick Stern preaching to the converted on green finance. I listened to Nick Stern (or Lord Stern) speak about the risks and opportunities of climate change and finance and investment. To be brutally honest, Stern was preaching to the converted and while everything he spoke about made sense I don’t think it was new to anyone in the room. That said, it did bring together a lot of professionals, experts, NGOs, regulators etc. To chat and the second order effects of mingling outside of a core expertise - I believe - is valuable. I also learnt a little about the Belt and Road endeavour from China. A few people involved in projects around the endeavour spoke on a panel. It happens to be potentially the largest ever infrastructure project in the world with approaching one trillion dollars worth of capital spend. It has a Silk Road element - the belt part which are overground corridors to/from China and the Road part (perhaps confusingly) are sea links, or maritime corridors. There’s a summary from McKinsey here and one on the Guardian here. Divesting sectors. The impact on returns. Evidence that oil divestment may not impact returns. Source: Jeremy Grantham, writes (see link to LSE talk here): note cavests below. Grantham and colleagues have looked at the S&P500, over the last 28 years, 60 years, and 90 years; excluding a major sub-component sector each time. Grantham’s overall conclusion it that it didn’t make much difference in return - although some might argue at the max range of 50bps that compounded over 28 years may be significant. Others might suggest that the power of diversifcation and time, also makes this conclusion unsurprising. Caveats could include: not peer reviewed (although I have found similar conclusions with slightly different data sets), different exclusions may produce different answers (specifically Tobacco might come up as a narrow exclusion; cf Dimson’s data set on “sin stocks”), and that S&P500 is not world representative (however it has the best long run data set, and is a widely used index that does represent a facet of corporate America). “So my colleagues and I finally carried out a test to see exactly how an investment portfolio would have been affected by divesting from a group of companies that are listed in the Standard and Poor’s 500, the index based on the market capitalisations of 500 large companies listed on the New York Stock Exchange or NASDAQ. These companies can be divided into 11 sectors (not including real estate). We considered the 10 long-term sectors (real estate was added relatively recently), and analysed how the index performed without each sector. Initially, we considered the period from 1989 until 2017. [The results are shown in Figure above]. You will see how dramatically the index changes with the removal of each sector – there is only a 50 basis points difference between the best and the worst. They are basically all the same! You will see that excluding the information technology sector made a small difference for a few years around the turn of the millennium. That was the technology bubble. Beyond the burst of the bubble, all of the indices track together again, as if nothing had ever happened. But basically, all of those 10 variations of the index track between 1989 and 2017 as if they were the same. So we decided to see what happened if we chose a different period, incase there was something extraordinary about the past 28 years. We extended the analysis, first to start from 1957, and secondly to begin in 1925. “Who knew that the stock market was that efficient? It may be hopeless in bubbles and busts, but it has evidently priced these groups of big companies pretty well. And there is no advantage to an investor of choosing the high-growth information technology sector over, say, utilities. Utilities are priced down and information technology is priced up, but they produce the same returns. It is amazing. What does this mean for divestment? It means that if investors take out fossil fuel companies from their portfolios, their starting assumption should not be that you have destroyed the value. Their starting assumption should be until proven otherwise. that it will have very little effect and is just as likely to be positive by 17 basis points as negative. That is an amazing contradiction to what every investment committee has ever said, as far as I am concerned. Both are theoretical although backed up by certain lines of empirical evidence (I’ve been drafting a long blog on the EMH for a while, hopefully out one day), although both are not considered perfect to explain what we can observe empirically. As Grantham alludes to, this suggests the power of reasonable large scale diversification, and time. It seems to suggest over long periods of time, no one sector has such strong outperformance that it significantly dwarfs a large fairly diverse group of companies/stocks. I’m guessing there are always 400 to 450 stock left in any one excluded portfolio. It’s an interesting challenge to certain notions of thematic and smart beta ideas as well, although those assessed differently. Many of us are in the forward looking future prediction game. Although again, this might suggest, as Warren Buffet and Jack Bogle do that the average investor is then best off in low cost trackers (although note possible limited stewardship??!! ), and if they wish to lose a sector or two it’s not likely to be a big impact (perhaps a small plus or minus in the order of 25 to 50bps; and arguably hard to predict although as Grantham argues, it might be oil, chemicals but for business related reasons). I actually see Grantham’s work replicated in shorter run indices. You can look them up put the ex-Tobacco or ex-fossil-fuel type indices over the last 5 to 10 years have all done better or in the same ball park than the standard index. 5 years is short run, but might suggest that something has happened in the last 5 years perhaps different to eras further back. In any case, back to oil divestment, so you need to know Grantham has a long time view (bias) here and sponsors the Grantham institute. Might mean he is right and has spent a long time thinking about this. He’s being doing investment (albeit more macro and asset class lens) for much longer than me. Still, this is a decent evidence base and theoretical framework for arguing for the divest – stranded asset argument. It also highlights the area for engagement, if it can help bend these companies at all. This all comes from a talk given in April 2018 at the LSE. In the lecture, Grantham is mainly focused on climate, weather and food. Slides here, talk below. On climate - click here for more carbon related posts. There's an argument made by risk philospher and Black Swan author Nassim Taleb on why we should lower pollution regardless of models. The current Arts blog, cross-over, the current Investing blog. Cross fertilise, some thoughts on autism. Discover what the last arts/business mingle was all about (sign up for invites to the next event in the list below). Some popular posts: the commencement address; by Nassim Taleb (Black Swan author, risk management philosopher), Neil Gaiman on making wonderful, fabulous, brilliant mistakes; JK Rowling on the benefits of failure. Charlie Munger on always inverting; Sheryl Sandberg on grief, resilience and gratitude. Rio sells coal, what about the planet? Thesis answer requested: Rio Tinto has sold its coal mine to EMR Capital and PT Adaro Energy, an Indonesian listed coal Co. Rio is now ex-coal. Reasonable people can disagree about the stranded asset, business and financial risks of coal and this impact on Rio’s cost of capital. But, from the point of view of the Planet, its inhabitants and the climate this has made no meaningful difference. Ownership has changed. How the mine will be run in the future has potentially changed. Certain reasonable people could argue it has made the situation from that point of view, worse. Discuss. 100 marks available. CEO Jacques has said that Rio is not exiting coal because of environmental concerns, but because it had better investment opportunities in iron ore, copper, bauxite and aluminium. I read both the gofossilfree movement on the arguments for divestment + Cary Krosinsky on the cons of divesting. (see links below) I advocate listening to the arguments, engaging in thoughtful disagreements, examining evidence and then making up your mind. Ray Dalio thinks we are losing the art of thoughtful disagreement. Meghan Phelps suggests there is hope. One of the best Munger speeches on how to think about a mental model of inversion can be found here. If you'd like to feel inspired by commencement addresses and life lessons try: Neil Gaiman on making wonderful, fabulous, brilliant mistakes; or Nassim Taleb's commencement address; or JK Rowling on the benefits of failure. Sheryl Sandberg on grief, resilience and gratitude or investor Ray Dalio on Principles. Cross fertilise. Read about the autistic mind here. More thoughts:  My Financial Times opinion article on the importance of long-term questions to management teams and Environment, Social and Governance capital. How to live a life, well lived. Thoughts from a dying man.